Got mine today and it looks good Updating first post to include all links. Oh wow, so nice! Thanks again! Hopefully, I will have time in May to order 2013 and 2014. Looking soooo much forward to hold them in my hands. Man, we are so amazing. I got my copies yesterday, luckily custom free. But on all six copies of the 2013 and 2014 calendars, the covers are mixed up! So 2013 has the cover of 2014 and the other way around. Man, was I confused at first. Well, I consider it to be a rare and surely valuable misprínt. But anyway, they look great! Just awesome, so overwhelming to hold these masses of amazing art in my hand. 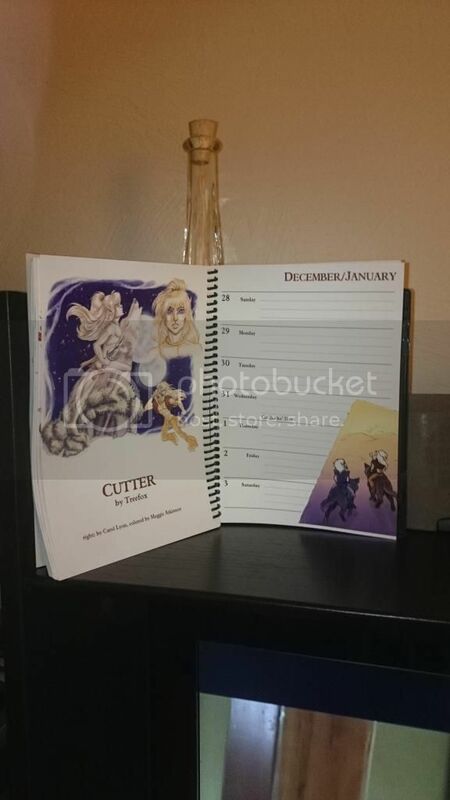 While I'm waiting for the new 2013 calendar to go on sale on Cafépress, I just wanted to show you that I'm continuing to have the pinup calendars on our living room shelf. This week the 2012 one goes side by side with the 2013 one. One final post from me in this thread. With past Sunday the last page of the three year pinup calendar is done. Thanks again for three years of art enjoyment. I sure will miss the new art on each Sunday.